Welcome to the 33rd issue of Indiana Voice Journal. Our featured visual artist for this edition is Toni Cogdell. Her work is stunning! She has also honored us with a couple of creative nonfiction essays that rock. 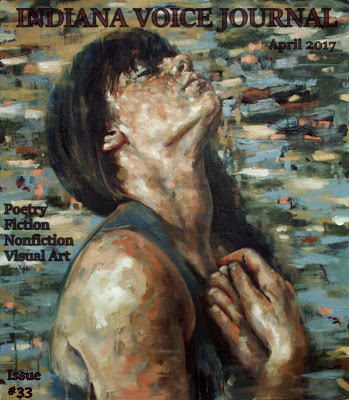 Be sure to check out the other essays, visual art, stories, and poems by authors whose words will take your breath away. With the publication of this issue, we've added a few new features to our journal. Check out our new Bookstore! We are featuring books written by authors published in IVJ. It is not yet complete. If you have written a book, published content with us, and would like your book listed on our bookstore page, please send the Amazon info.We are also giving space, occasionally, to a new feature titled "Literary Places". We hope you enjoy this issue!